Brentford star Alan McCormack returns to Preston this afternoon with no regrets or ill feeling towards the club where it all began for him. The Irish defender – who can also play in midfield –arrived at Deepdale 11 years ago almost to the day as a raw 18-year-old. Plucked from local league football in Dublin, McCormack was handed a trainee contract by PNE’s youth team coach at the time Simon Davey after impressing on trial. He soon progressed to the fringes of the first-team squad and was handed his debut by Craig Brown in a Lancashire derby against Burnley at the age of 21 in March, 2004. His arrival on the Turf Moor pitch in the 55th minute as a second half substitute for Dickson Etuhu was expected to herald the start of a long and fruitful career in North End colours. And while he made an immediate impact against the Clarets – North End equalised three minutes after his introduction – unfortunately, his Preston career never took off. After only a handful of appearances and a number of loans spells, McCormack’s four-year stay in the North West ended when he joined Southend United in 2007. Since then, McCormack has enjoyed a fine career operating predominantly in the bottom two rungs of English football. He has made more than 350 league and cup appearance for a number of clubs including Charlton Athletic and Swindon Town. Arriving at Brentford during the summer, he has helped his new club rise to third spot in the table – one place and two points above North End. While disappointed that he never fulfilled his potential at Preston, McCormack has nothing but fond memories of his time at the Deepdale. And he wishes nothing but the best for his former club – apart from today! McCormack said: “It is something I enjoy – going back to my old clubs – no more so than Preston. “I still have got a lot of fond memories from my time there. “It was where my story started. “It was 2002 when I arrived – Craig Brown was the manager. “I was 18 and playing for my local team back in Ireland and there was a Preston scout who came to watch us. He asked me if I fancied coming across for a trial and so I went for a week and managed to impress enough to be offered something by the club. “Simon Davey offered me a year’s deal, but because of my age, it was a third year YTS. “I knew it was my last chance to do anything in the game across the water in England so I took it. After the 1-1 draw against Burnley, McCormack started for Preston in the next game – a 3-3 draw against Sunderland at the Stadium of Light. 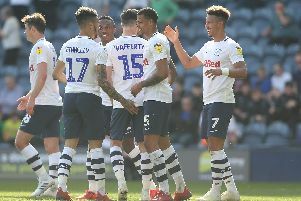 His second full appearance didn’t end happily as North End found themselves on the receiving end of a thumping 5-1 defeat by Derby County at Pride Park. That would be the last time he would start a game for Preston. He went on to make two further appearances from the substitutes’ bench towards the end of that season. When Billy Davies took over the managerial reins at the start of the following campaign, McCormack began the early season very much part of his plans. However, he eventually began to drift away from the first-team picture and spent part of the season on loan at Southend. The 2005/06 season was spent primarily on loan at Scottish Premier League side Motherwell, but he returned to Deepdale at the start of the next season and featured in the opening games. However, he soon fell out of favour and eventually joined Southend on a permanent basis on January 1, 2007. McCormack said: “I did not play that much in my time at Preston. “Obviously I was a young lad who had come up through the youth ranks. “I did get involved in the first team for one or two spells and played a few games, but not that much really. “I had a couple of loans spells elsewhere and I eventually left to join Southend United to try to further my career. “But it was a great experience for me to be around Preston during that time. “I was around some good players and they were doing well in the Championship under Craig Brown and then Billy Davies. “They achieved a lot during those years in the Championship. “I learned a lot as a player and took a lot from training and playing with the quality of players which were at Preston at the time. “I don’t really look back at my time at Preston and feel like I deserved more or I should have played more games. “I know how hard it is for young players to try to break through into an established side. “Even now I look down the ranks at Brentford and see the young players and talent that there is – but they don’t seem to get a chance because of their age. “Obviously the exceptional talent gets brought forward and I think nowadays they do get more opportunities. “But when it was my time – I was probably one of only a handful of young players who were around the first team squad. “It was very difficult to get involved in that squad because of the quality of the senior players – people like Graham Alexander, Chris Lucketti, Paul McKenna, Brian O’Neill. “Those players had played hundreds of games at the top of the Championship, even Premier League. “So it was very difficult to come out of the youth system and try to get involved alongside those players. “But I took a lot from it and enjoyed it. “I hold no grudges. Preston gave me a chance in the game and I’ll always be grateful for that. “But I’m glad I moved on at the time I did. North End are currently on a 11-match unbeaten run, which boasts seven victories. Brentford’s recent record is perhaps even more impressive as they have registered eight victories from their previous nine outings. McCormack is sure he and his team-mates will arrive at Deepdale in confident mood, but admits his team will have to be at their best to prevent a home win. “Preston is still a massive club – there’s no getting away from that fact,” McCormack said. “That has to be expected when you’ve dropped down the league a little bit like Preston unfortunately have. “But we have seen the force that they are this season under Simon Grayson. “Last season they had a few sticky spells as well as having some good runs. “This season, they are a lot more consistent – they are a very strong side. “We have watched them on DVDs and we know it’s going to be a really tough game. “We will be showing Preston plenty of respect, but we know that we are a team who will be difficult to beat as well. “We are in third and Preston are in fourth. “Both teams have kind of mirrored each other’s results up until the last few weeks. “When we’ve won, they’s won and when we’ve lost, they’ve lost. “We’re probably the two in-form teams in the division. “Thankfully, ourselves and Preston have managed to claw some of the points back on the top-two teams. “At one point, Leyton Orient were 12 points ahead of us. “Both teams have shown a great run of form of late and if we both play to our best this afternoon, it should be an excellent match for both sets of fans. Perhaps the most eventful period of McCormack’s career was the time he spent working under mercurial Italian Paolo Di Canio at Swindon. It was Di Canio who switched McCormack from central midfield to right-back. And the decision proved to be a master stroke as the 29-year-old helped the Robins claim the League Two Championship in 2012. McCormack has nothing but praise for the former West Ham and Sheffield Wednesday’s star’s coaching ability. But admits he was not immune to having his run-ins with the eccentric Italian off the pitch. In fact, one of Di Canio’s last acts before departing Swindon at the beginning of this year was stripping McCormack of the captaincy after he reprimanded him for missing a training session due to illness. In the first match after Di Canio’s departure – incidentally against Preston at the County Ground in Grayson first match in charge – McCormack was restored as skipper. McCormack said: “As a coach, Paolo was exceptional. “He was very detailed with what he did – very hard working. “He planned us to a tee. He was regimented, strict and wanted to be the best. “Paolo wanted his teams to play to perfection and play 100% every game. “He would be unhappy when we did not do that, but he would understand when we didn’t because you can’t always play to your best in every game. “But as long as you were hard working, he would always accept that. “I think off the pitch, his man-management style was probably always going to cause problems. “He didn’t agree with the English style of football and coaching. “He didn’t agree with players having days off – things like that annoyed him. “We have seen that at Sunderland, the players didn’t like the way he treated them and it went wrong for him. “I had a few disagreements with him towards the end of his time at Swindon when he didn’t accept I was ill.
“I remember the last time I played at Deepdale which was last season for Swindon, we had the famous incident when he took our keeper off after only 20 minutes. “But as a coach, he was just fantastic. “He would dedicate every hour of every single day trying to make his team a better team. It was a surprise when McCormack was allowed to leave Swindon last summer. Grayson admitted this week that he considered making a bid to bring the popular defender back to Deepdale for a second spell. But by the time he had weighed-up up his options, Uwe Rosler stepped in with an offer the 29-year-old could not refuse. “I was glad I got the offer from Brentford,” McCormack said. “I was going to stick with Swindon so I wanted to hear from them first. “If they had offered me the deal I wanted, I would have stuck with them. “But they didn’t – they just offered me a one-year deal. “It annoyed me a little bit. I was the club captain and helped them achieve promotion from League Two and we had reached the Johnstone’s Paint Trophy final. “I felt I had put in good performances week in, week out and had given my all for the club. “I felt a little led down, so as soon as I met with Uwe, there was only one place I wanted to go to. Rosler’s ambition has resulted in him being head hunted by FA Cup holders Wigan Athletic, who have installed him as their new manager. In his place, Brentford have appointed Mark Warburton, who has left his role as the club’s sporting director. He got his tenure off to the best possible start with a 1-0 victory over Oldham Athletic at Griffin Park last weekend. “There’s been really no change since the new manager has come in,” McCormack revealed. “Training has been the same – there’s been a few tweaks here and there.